I’ve written before how amazing we are as veterinarians. We are 10 different specialties all wrapped into one spectacular person. When we decide what type of practice we are going to work for we may narrow down the spectrum of care we produce. GP clinics focus on vaccinations, nutrition, and common ailments that affect our pets daily. Specialty clinics focus on the complicated and sometimes unusual. Emergency clinics focus on trauma cases and true emergent situations. It’s great that we have all sorts of specialties in the veterinary world. The biggest obstacle is us working together for the good of the patient. Its not that we do it intentionally but I think a lot of clinics don’t have protocols set during times of emergency and this makes it harder for the referral clinic to treat. Here are a couple of basics to put on a checklist if you often refer emergency cases. Call the referral clinic- if you plan on sending a case please call the referral center and discuss the situation. The best route is to have the doctor call and give information to a technician or the referral doctor for a clearer line of communication. Having a receptionist call is not a good option because they cannot properly answer basic questions like, were radiographs taken or how stable is the pet. Many times we have been given the absolute wrong information because of the mechanics of the game telephone. When in doubt always relay the information directly to the referral doctor. 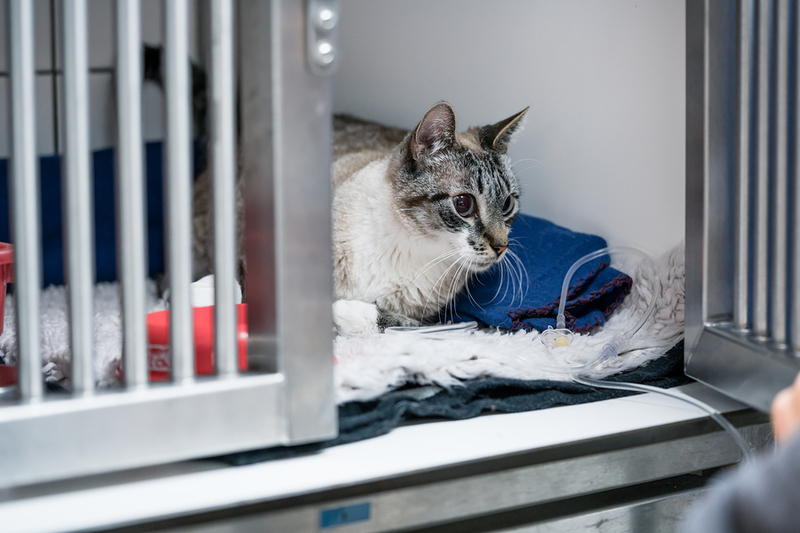 Start an IV catheter- There aren’t many situations where this isn’t necessary but unfortunately, pets get transferred without catheterization and fluid stabilization all of the time. Think about it- hit by car– place a catheter and start fluids to reduce a shock state before transferring. Blocked cat- place a catheter and start fluids to stabilize. Bloated dog-place a catheter and start fluids. This is a critical step in stabilizing and many animals do not receive this before going to a referral center. Provide pain control- too many times patients are provided no pain control before being transferred. It is fairly easy to have a go-to chart for a quick buprenorphine or hydromorphine dose to relieve acute pain in unstable animals. Wait on any NSAIDS or steroids before a full workup can be done but a short course of an opioid can truly affect how a patient recovers. Send diagnostic results- If you plan on referring please send the results of the diagnostics you have performed. It does not help when you have taken radiographs but don’t email them to the referral clinic. It also is a big waste of the owners’ money if you perform blood work by sending it to an outside laboratory where results won’t be ready for 24 hours. If you don’t have in house labwork equipment and plan on referring that day its best to allow the referral center to perform it versus wasting time and money. Inform owners. Please make sure your owners know what they are getting themselves into. Too many times pets are transferred with no knowledge of the next steps towards recuperation. Several times I have seen blocked cat owners choose euthanasia after having to pay a second exam fee and blood work because they were not prepared for how expensive treatment can be. You might not know a specific number but please warn owners that certain surgical cases can run a few thousand dollars (depending on the area) and it is a huge waste of the owners’ funds and time if they do not want to go forward with treatment. We all want what is best for the pet and to do that we need to work together. Communication is key but also don’t forget your basic triage skills. You can truly make the difference if a patient lives and recovers well versus tragically succumbs to its crisis. Dr. Nicole Palumbo is a 2012 graduate from University of Illinois. She is originally from the south side of Chicago but chose to move to Northwest Pennsylvania for her first job out of veterinary school. She works with small animals, exotics, and also volunteers her time at the local wildlife rescue, typically performing surgeries and exams on the many raptors that are admitted to the facility. Recently she has taken a job with an emergency/general practice closer to Pittsburgh. With time she hopes to focus more time on wildlife medicine and also obtain specialization in feline medicine. Copyright © 2019 Pets-99.com. All rights reserved.